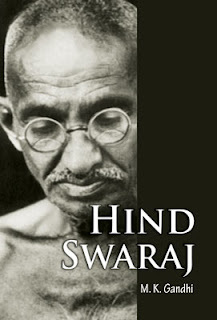 I decided to begin my day by reading sections of Gandhiji's masterpiece 'Hind Swaraj' (from Chapter 6 onwards). The book, in the form of a conversation about what it meant to free the colonised India, was written in 1909. The following paragraph, which is very alive for me today, is like a prelude to my own sankalpa. 108 years have passed since this was written. Though our civilisation has further eroded, it can still be said that it is surviving the shock, and quite well. But the time has come for us to take it from a place of mere survival to a place where it can thrive from. In order to do this, we need to do two things. We need to truly touch deep within us, roudram, the rage of being lied to (and in a sense, betrayed) by a few colonised generations before us and have the fire stoked. And then go deeper than the rage, touch the deep pathos in the ignorance that engulfed us saying 'They (we) didn't know better then!' 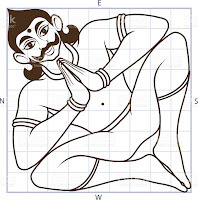 And understand and intuit the real deeper reasons for whatever unfolded the way it all did, transcend both rage and pathos (while holding them within), touch the space of kārunyam, compassion. Going through this with all our sincerity alone will give us the vīryam, the authentic energy to act like true warriors. And this is what, I see Gandhiji's 'Hind Swaraj' was being a loud call to! In my embodied exploration of 'What is India?' I am embarking upon a journey to understand vāstu śāstra. This evolved science from India draws me for two reasons. 1. As a student of Fine Arts in the 1990s, temple architecture was what I was most drawn to. Something about its intent to manifest the highest form of energy on this material realm drew me to it like a magnet. As I was preparing myself to becoming a researcher in this area, I was carried by the other stronger pull towards activism. I'm very delighted to be picking up this thread again, with a deeper understanding. 2. In the two decades of my departure (1997-2017), I have worked extensively with groups of people coming together in varied forms and in varied contexts. A whole spectrum of organisations from 'debilitatingly hierarchical' on the one end, to 'structureless and flat' on the other. Having a designer's mind, the question about organisational design has always been alive for me. And I'm discovering that vāstu śāstra has a lot to offer in this area. What would an 'Indian way of organising spaces for people to come together to co-create' look like? This is my parallel area of study. I'm truly blessed to be undertaking this journey under the mentorship of Raghu and Sashi. The way they have lived (and continue to live) their own lives in the spirit of 'All life is Yoga! ', the utter confidence with which they claim their own power, the openness and dignity with which they share their vulnerabilities and human failings and struggles, and most of all, the sincerity with which they have extended their invitation to truly co-create, move me beyond words can express. I pray that I may be worthy of the offering by them and the community of fellow-seekers who have committed to be on this collective journey together! A talk by Sashi on Introduction to vāstu śāstra.